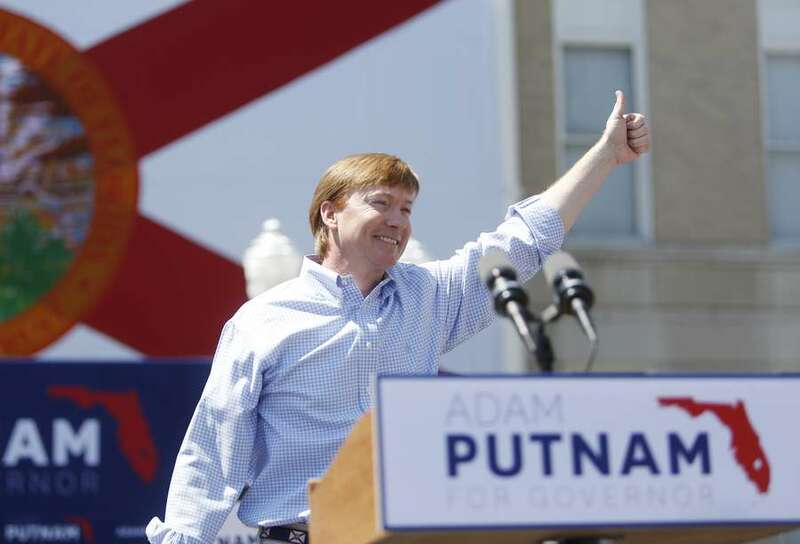 OCTAVIO JONES | Times Adam Putnam, Commissioner of Agriculture starts his gubernatorial campaign at the Old Polk County Courthouse in Bartow, Florida on Wednesday, May 10, 2017. "I can't imagine that a state that has done so much to encourage youth hunter safety would outlaw the purchase of any and all firearms by someone under 21," Agriculture Commissioner Adam Putnam said in a statement when asked where he stands on the assorted gun control proposals — arming teachers, three-day waiting periods, bump stock ban, raising the minimum age for buying a rifle from 18 to 21 – by the governor and legislators. Republican gubernatorial candidate Ron DeSantis has not responded. "I support Governor Scott's efforts to make our students and teachers safe at school. Hardening our schools, training personnel to respond to active shooters and breaking down the barriers that stand in the way of communications between law enforcement, school officials and mental health personnel will make a difference. I also fully support a swift and thorough investigation into the Broward Sheriff's response to the Parkland shooting." "As someone who grew up in possession of firearms, learning a respect for firearms and practicing the safe use of firearms as part of my heritage, I can't support any policy or any law that destroys the family tradition of possessing and practicing safe use of firearms. I can't imagine that a state that has done so much to encourage youth hunter safety would outlaw the purchase of any and all firearms by someone under 21." Update (3:20 pm): The NRA praised Putnam for his stance on Twitter Wednesday afternoon.